Members of the December 2018 work party. Two months earlier, dense arcs of Himalayan blackberry cane hid this view of the lake!! Special Note: there is no work party scheduled in January. February work party is the second Daturday, Feb. 9, 2019 – 9 am to noon. March work party will be the third Saturday, March 16, 2019 – noon to 3 pm. Winter is a good time to look back on the past year and think about goals for the new year. In 2018 we had 12 work parties that attracted 125 volunteers who pitched in a total of 333 hours of weeding and digging. That is nothing to sniff at. Our work this year focused a lot on maintenance: the weeding and watering of our two restorations sites. Late in the year we began opening up a new restoration site for future planting. In 2018 was significant in that Garet Munger stepped away from active participation as co-lead with Andrea Watts. We miss Garet who moved away from the neighborhood and is now volunteering elsewhere, but he does stop by occasionally to spur us on. Dan Kujawinski and Rob Hutcheson have joined Andrea in organizing and leading the work parties. We wish Garet the best and thank him for his years of involvement with Green Lake. For 2019 our goals are 1) continued maintenance to the give new plants in the restored areas a chance against weeds and invasive plants and summer drought and 2) open a new area on the west side (adjacent to Aurora Ave) where the Himalayan blackberry canes are at their densest. We have over 60 barefoot plants to get in the ground that are being donated by the King Conservation District. Thanks to everyone who was able to help out this past year. Your work was vital in making the shoreline of Green Lake healthier and more pleasing to the eye. Many of our volunteers are students or others who are fulfilling volunteer requirements and who typically show up just once. But the beating heart of the restoration work are Green Lake neighbors and friends on this email distribution list who are stalwart stewards. Especially, we raise our spades in thanks to the following friends who showed up month after month last year, rain or shine: Mike and Shirli Seamans, Mike McDowell, Michael Pace, and Andrew Fraser. If your New Years Resolution includes getting more active in your community, then we are here to help. Consider becoming a co-lead to the work parties. 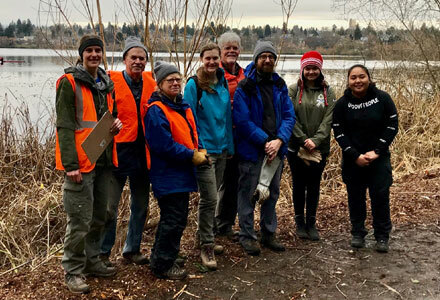 Because our restoration sites around Green Lake are very much spread out and because we have many student volunteers, we need more help with leading the work parties. This requires minimal time commitment since it is restricted to just the day-of a work party and only for those months that you would be available. The work is straight-forward and does not require a lot of training: helping set up and store tools, greeting volunteers, helping distinguish native from non-native invasive species, making sure tools are safely handled, things of that nature. The more work party leaders we have, the more restoration work we can get done. Questions? email at greenlakestewards@gmail.com or call or text Rob Hutcheson at 206 854-1654.